With St. Patrick’s Day right around the corner and spring not far behind, it’s not too early to start planning for parties and special gatherings! These Rainbow Desserts will add a pop of color to a party table. If you have little hands eager to help in the kitchen, many of the rainbow dessert recipes below are kid-friendly and will inspire baking marathons for the whole family! This Easy Rainbow Jello looks anything but easy when finished and will definitely impress your guests – or your own family! How cute would these Rainbow Marshmallow Pops be at a rainbow themed party? Our own Skittles Rainbow Sugar Cookies Bark only requires three ingredients! Your kids will go wild over Rainbow Cupcakes with Buttercream Frosting. The swirled colors are so much fun. Rainbow Candy Popcorn? Yes, please. We’ll take a whole bucket of that! Surprise your party-goers with an unexpected Rainbow Poke Cake. They won’t know that it holds so many colors until you slice it up. This chocolate version of Rainbow Bark with Pretzels looks divine. There is no reason to stop at just one cupcake when you make Mini Rainbow Cloud Cupcakes. The rainbow icing ribbons on this Rainbow Cake are so pretty, they would be hard to eat. Looking for a slightly healthier dessert option? Try Rainbow Fruit Mini Tacos. This vegan, gluten-free, dairy-free Fruit Pizza is an excellent choice if you need to remain allergy-friendly. Gluten Free Rainbow Cupcakes are another option for reduced allergen baking. And they’re adorable! Rainbow Cake Mix Cookies make a cute treat anytime – not just holidays. For something totally unique, take a peek at the Rainbow Sprinkle Sugar Cookie Slush. How fun! Finally, save this idea for Rainbow Cupcakes in a Jar for when you need an out of this world teacher’s gift or make and take girl’s night. Absolutely. They all make me think of SPRING! I know kids go wild for these fun bright colors! Thanks for linking up to us on Throwback Thursday! I have to say, adults kind of go gaga for these rainbow desserts, too. They’re such fun eye candy! Love love love it!! 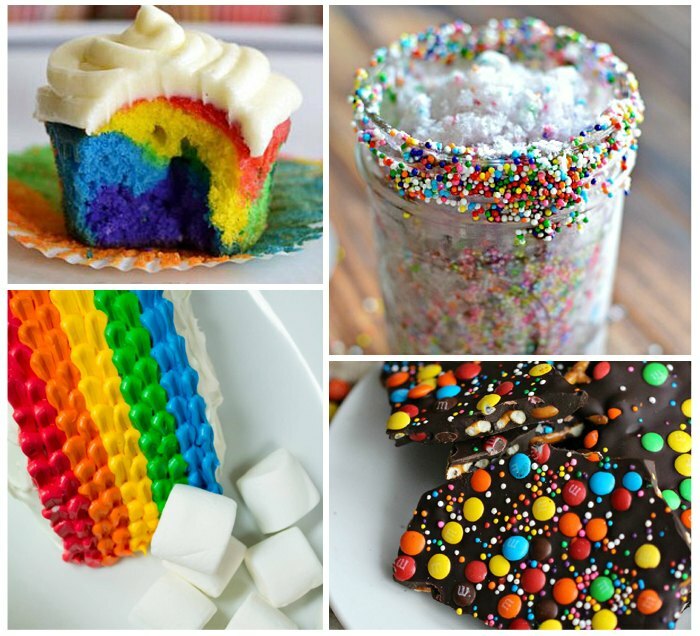 I adore Rainbow coloured food! 😀 I love those cupcakes the most! Thank you for sharing this with us at #SaucySaturdays! Now, that’s what I call a rainbow of fun! Clever, fun ideas! These desserts look amazing and so fun for kids to help make these recipes. Thank you for sharing at Dishing it and Digging link party. The rainbow jello got me. There was a parent at my kid’s school who would bring it to potlucks. It was always a hit. Gorgeous colors and ideas. Thank you for bringing it to FF. What clever ideas! Thank you for bringing them to FF. 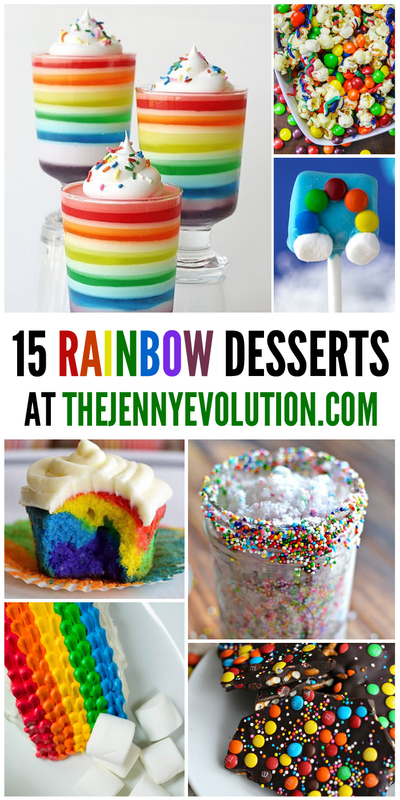 A great collection of Rainbow Desserts! Thanks so much for sharing your awesome recipe with us at Full Plate Thursday. Hope you are having a great week and come back to see us real soon!